I designed the party invitation taking inspiration from L.O.L. Surprise Doll’s cute and colorful fashion. Sweet, fun, and girly was the goal, so the striped pink background and the use of mint green to complement it, was a no-brainer. I also edited and customized the header with Zoë’s name to make it resemble the L.O.L. logo. 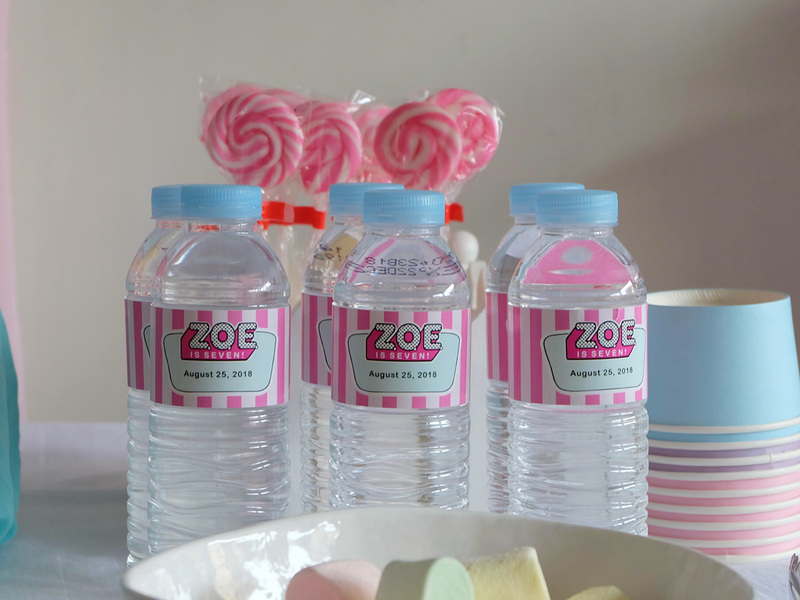 Zoë’s short three-letter name was a bonus, as it fused perfectly into the original logo! To complete the design, I added fancy tot Bon Bon from the Cosplay Club of L.O.L. Series 2. 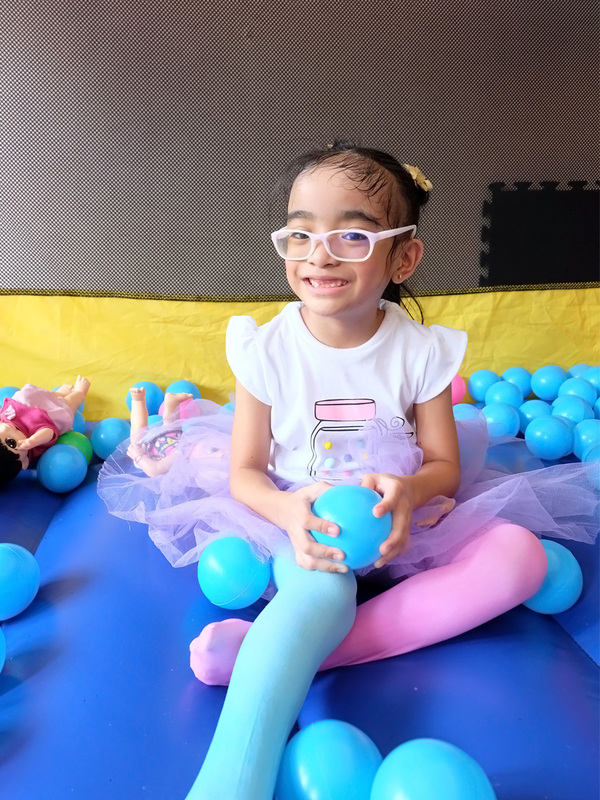 With her lilac glasses and bright sense of style mirroring Zoë’s own looks and personality, she was just the perfect fit! Since we had the party at my parents’ tiny garage, I set up a small dessert table and made it the focal point of the celebration. 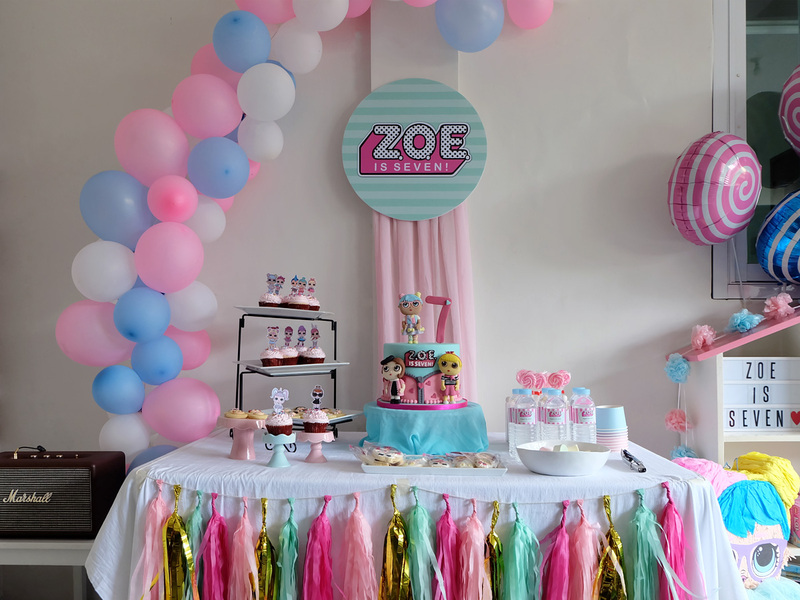 The backdrop features a DIY balloon garland using pink, blue, and white balloons in various sizes. The intention was to make it appear like a flowing river of L.O.L. Surprise balls, enough to make any girl scream with delight! 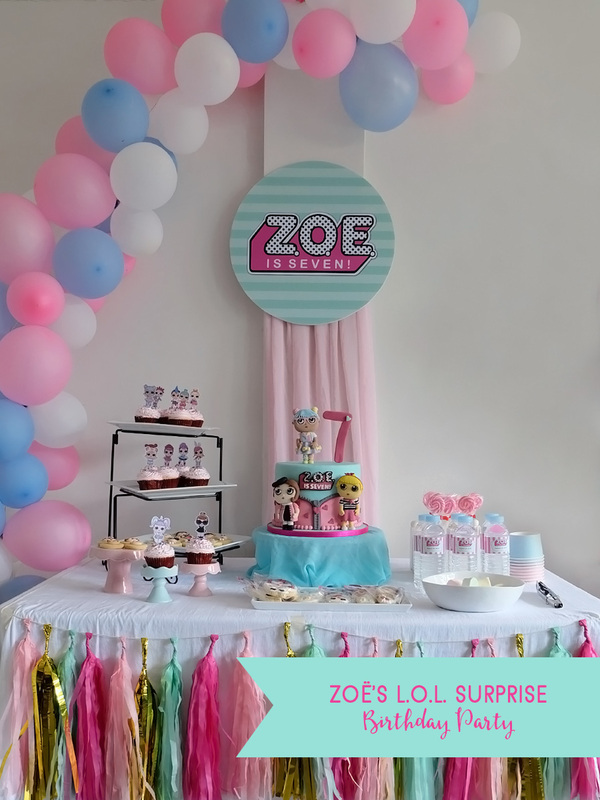 At the center of the wall, I designed a round “Zoë is Seven!” banner (printed on sintra board) to look like a faux L.O.L. Surprise ball. Flowing under it, I added pink chiffon, to give the entire look a soft and flowy texture. To dress the plain white dessert table, I tied a colorful tassel garland around the front of the table. It gave it just enough glam and pizzazz. And the gold foil tassels? It definitely added that needed shimmer and shine, perfect for this fashion-forward Birthday bash! For the dessert table’s centerpiece, we ordered this customized 8″ L.O.L. cake from Canvas Cake Studio. We used the same cake for Zoë’s candle-blowing party at school the day before our house party, so we opted for a non-edible cake to make sure it would last. 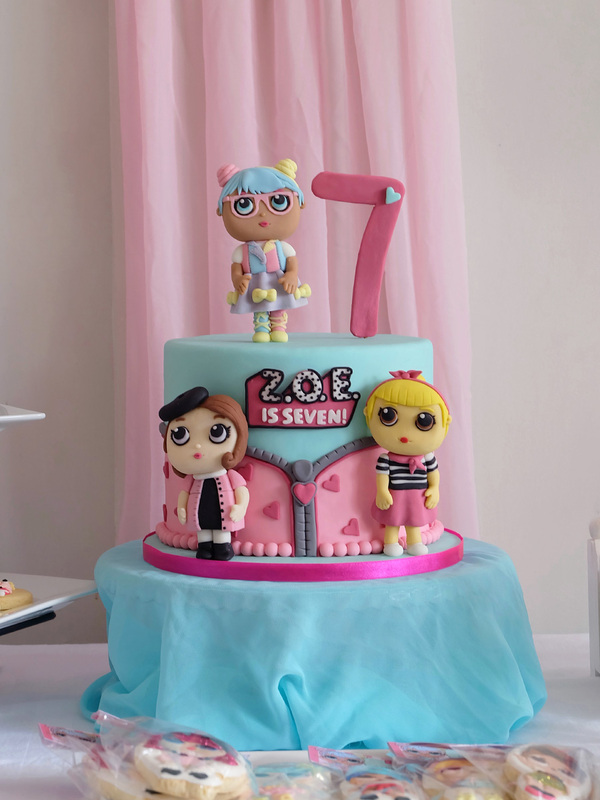 The dummy fondant cake features a zipper detail like those found on L.O.L.’s packaging, with the “Zoë is Seven” logo front and center. 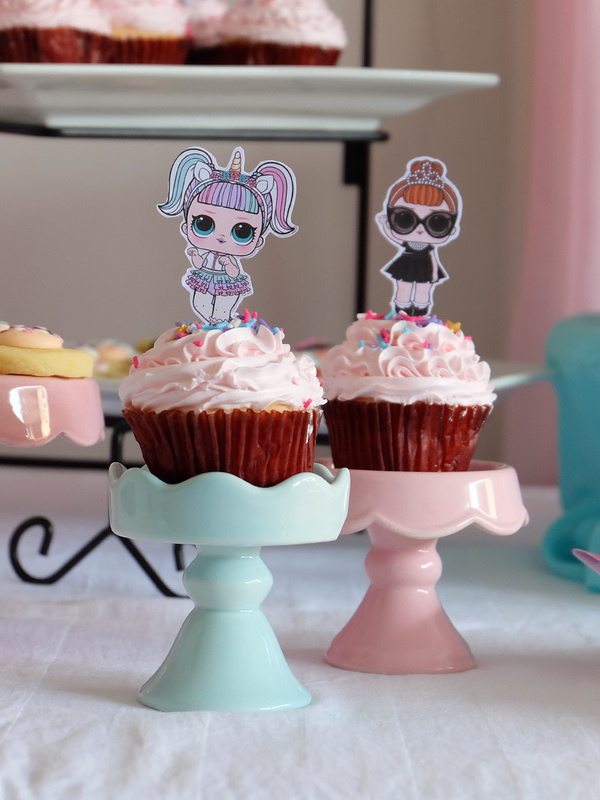 For the main cake toppers, we chose three L.O.L. 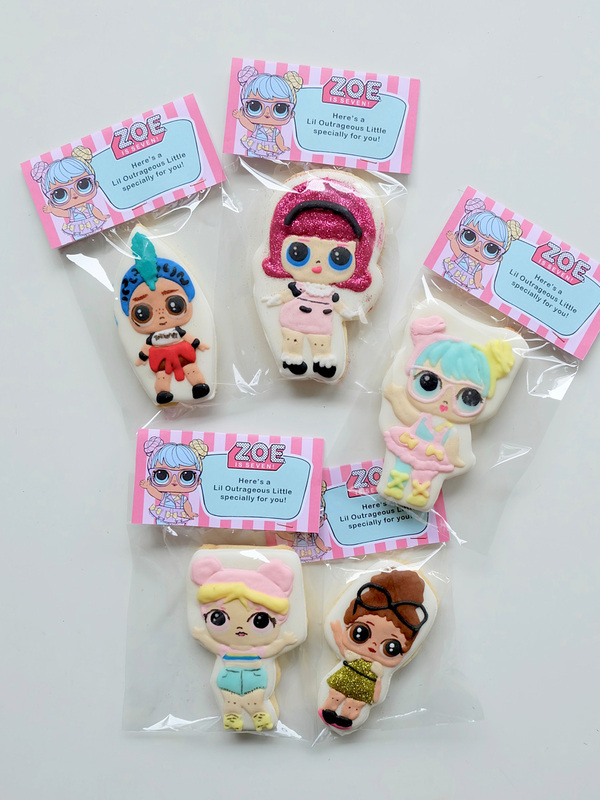 dolls made of fondant: Bon Bon, Posh, and Sis Swing. For our store-bought strawberry cupcakes, we simply added candy sprinkles, then placed L.O.L. 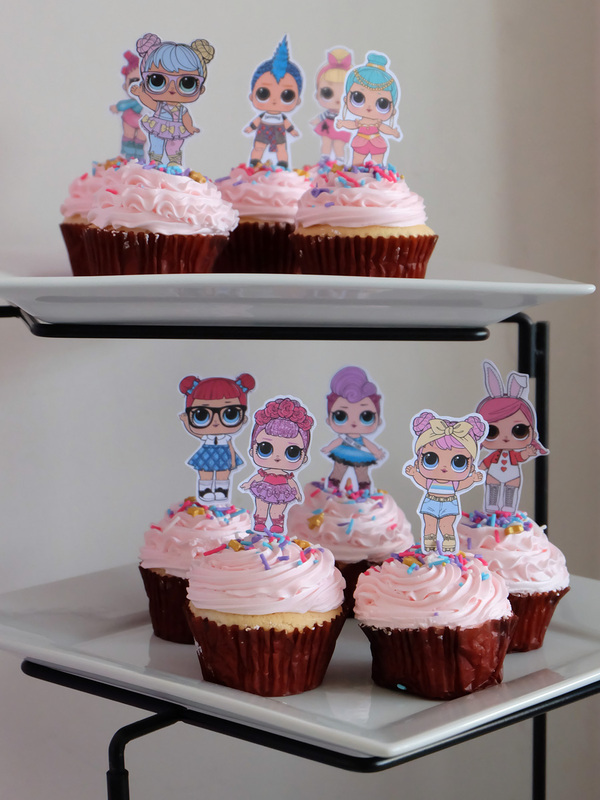 Surprise Doll toppers printed on card stock. Cute and simple! These mini L.O.L. 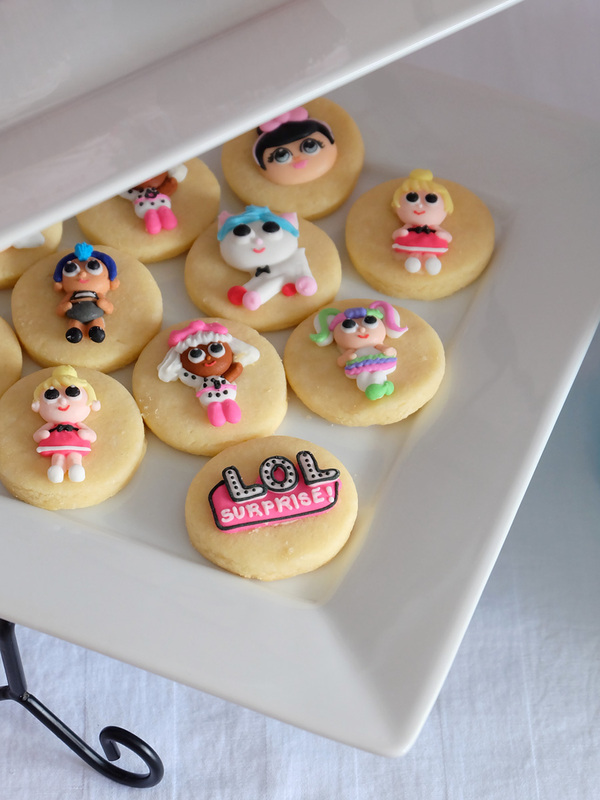 cookies feature ready-made royal icing toppers from Caketopps. 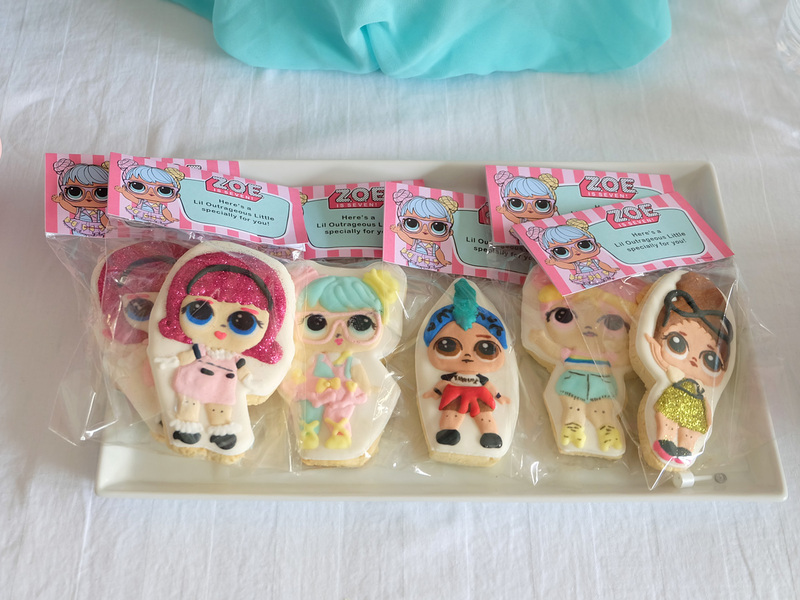 The toppers are perfect to top on cupcakes, but just like Zoë’s Moana Birthday party, I added them to my homemade mini sugar cookies, for a quick and fun treat! These L.O.L. 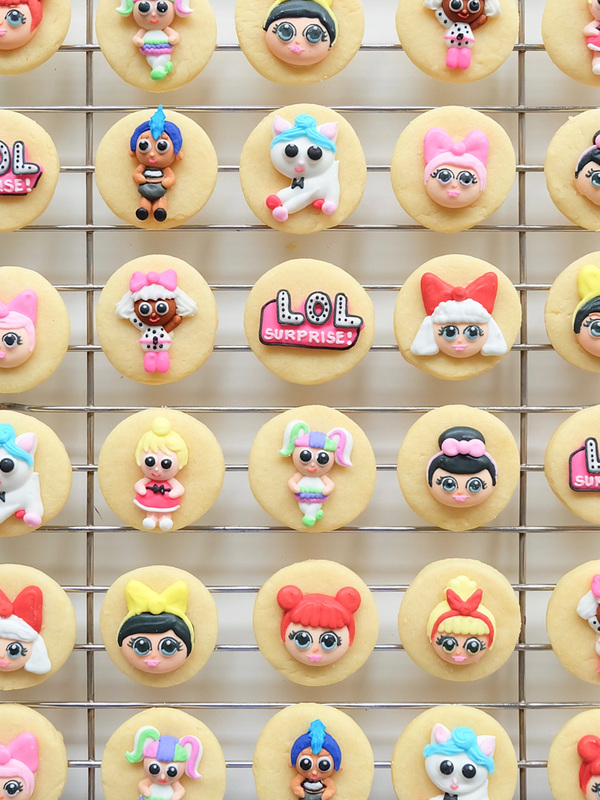 Surprise Doll sugar cookies are from The Little Whisk. Aren’t they adorable?!?! Maggie makes the prettiest and yummiest cookies! 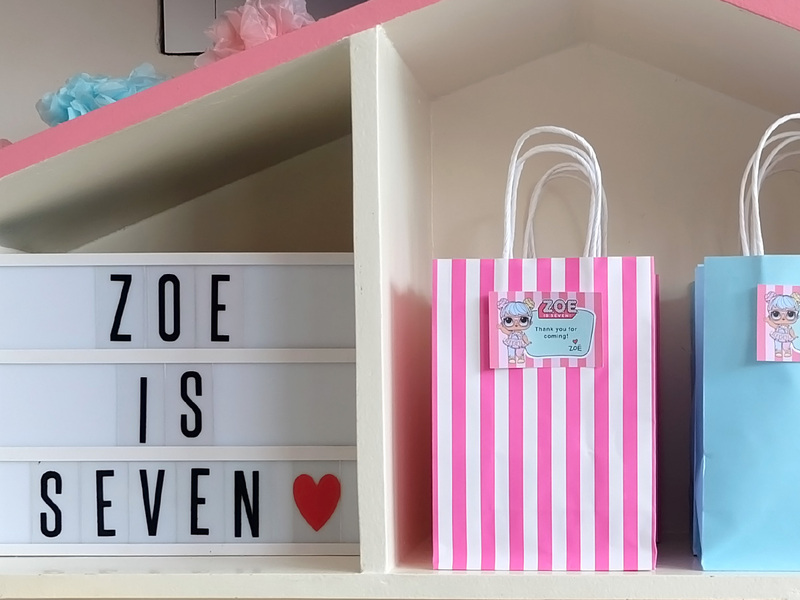 I just added the customized cookie bag tags and they were perfect little treats for Zoë’s friends! 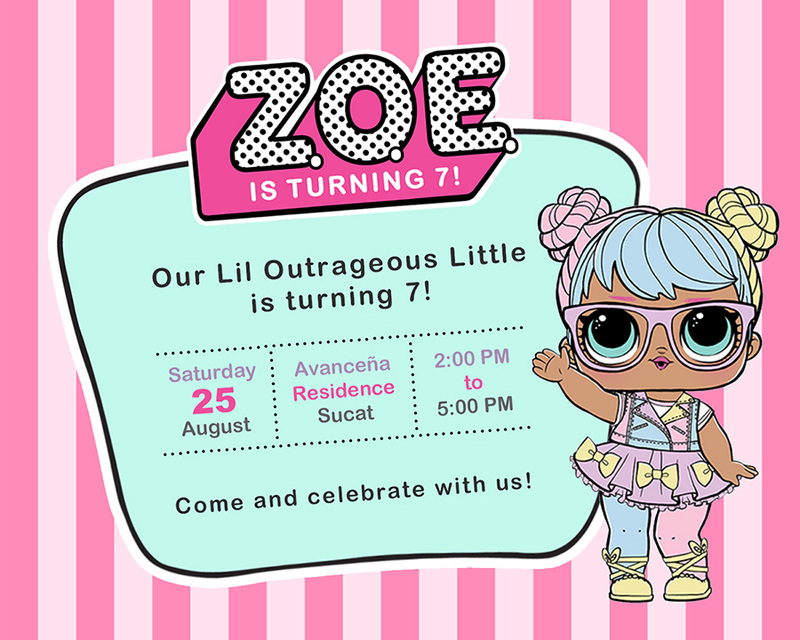 Our little seven-year-old doll! To go with the running theme, we chose L.O.L. 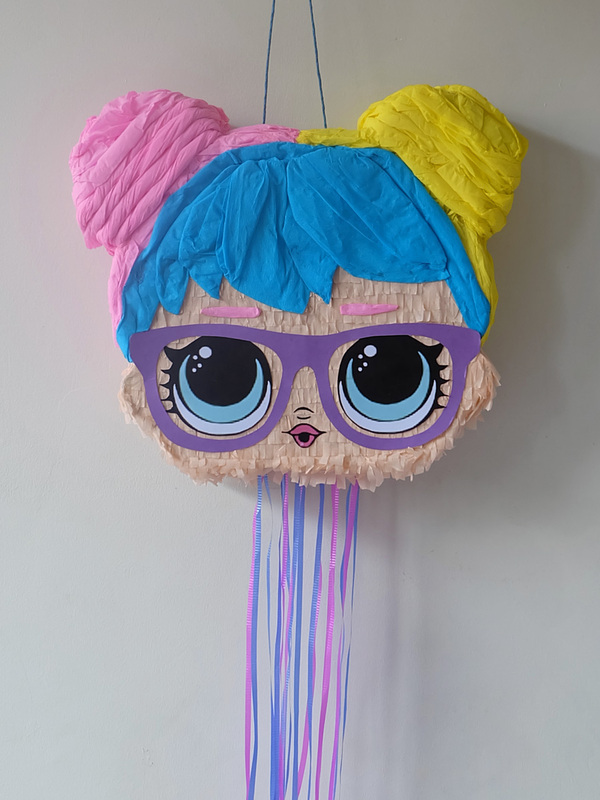 Surprise Doll Bon Bon as inspiration for her costume. I didn’t have time to copy and customize the entire outfit, but I made use of stuff we already had at home to DIY the look. 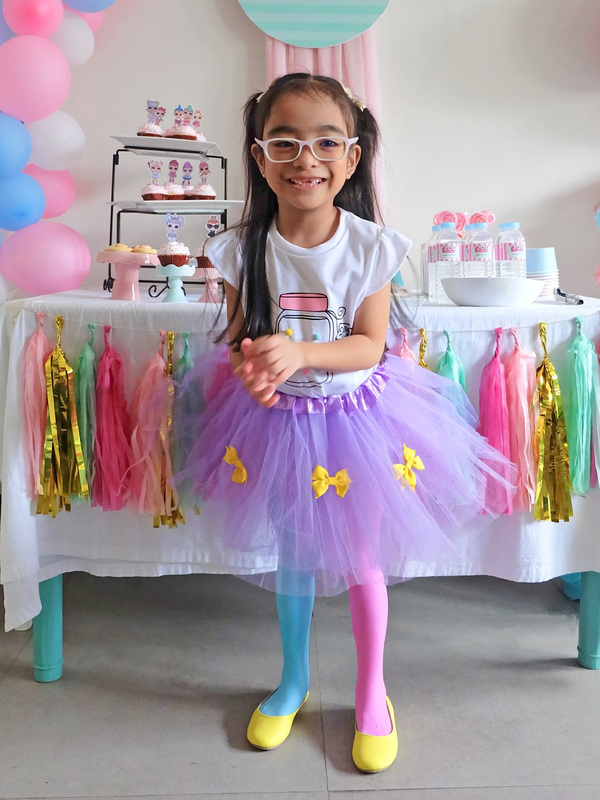 I started off by adding yellow bows to a purple tutu that Zoë had lying around at home, then paired it with a white top. I then dyed her tights pink and blue using food coloring, then bought her yellow ballet flats for the added pop of color. Zoë’s purple glasses completed the look, effortlessly. She looked fun, colorful, and was definitely dressed to impress! 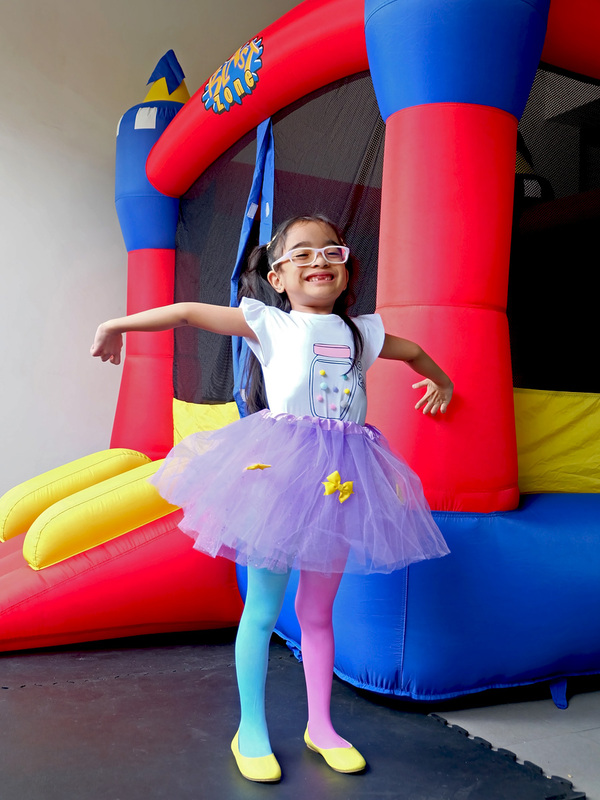 Since the party was an intimate celebration with just a few family and friends, we opted not to have the typical party games, and set up a little bouncy castle instead. 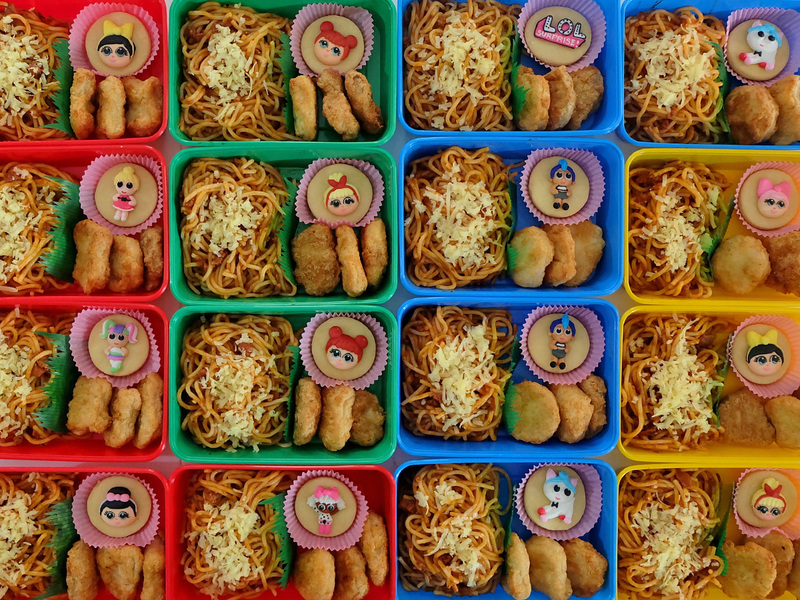 We wanted something different, and the kids sure had a lot of fun bouncing around! The Birthday Girl sure was pleased! Zoë’s L.O.L. 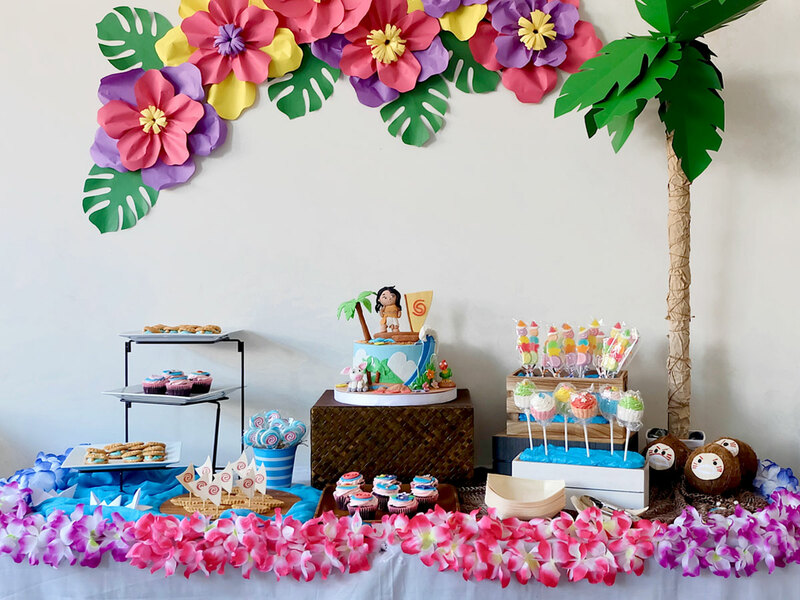 Surprise Party, though small and pretty simple for a seventh Birthday party, was fun, colorful, and dolled up with pretty party decor. 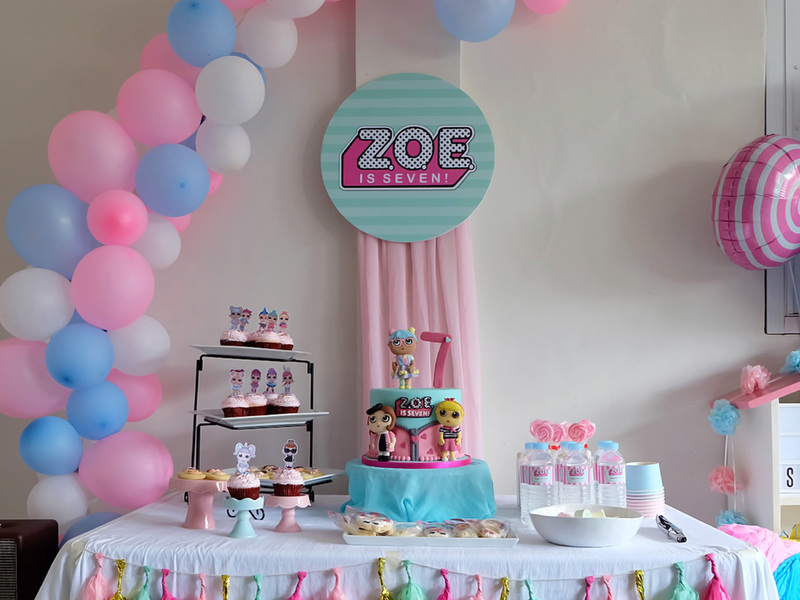 It was everything Zoë wished for, and everything this DIY-loving momma wanted to achieve–the sweetest and most gorgeous surprise for our Lil Outrageous Little!